Extra rich Jason Smoothing Sea Kelp Shampoo deeply moisturizes your hair with delicate tropical extracts of sea kelp, KuKui nut, awapuhi (Hawaiian ginger), plumeria and orchid, and fortified with vitamins A, B5, C and F. Restores healthy shine and manageability. Plant-derived panthenols deeply penetrate the hair shaft delivering long lasting moisture, reducing the formation of split ends and increasing volume and manageability, leaving healthier, shinier hair. Made in USA. This is probably my favourite Jason Shampoo. I love the way it smells. I love this shampoo. I love the smell and the way it cleans my hair. I've been using it for 3 years! I used to use this shampoo years ago because I loved the smell (it reminded me of the ocean). Recently I decided to give it a try again. Apparently they changed the formula because it now smells like musty dead flowers. While it cleans my hair reasonably well, I won't be buying this again. I really dislike the smell of this product. It actually reminds me of baby powder. It foams well, but the smell is too much of a put off. Will not buy again. 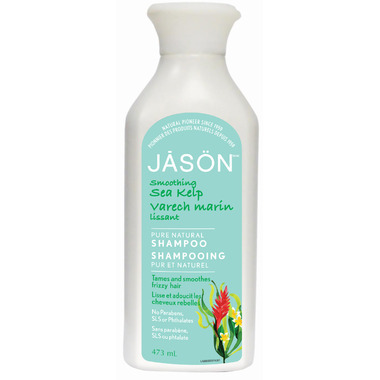 I love this shampoo and conditioner and am now buying more and more Jason products. It has a strong smell, which I really like (natural smelling - not at all perfumy), but I can understand other people may not enjoy it. I liked the smell so much that I bought the sea kelp chapstick which has a similar aroma. It helped me manage my damaged hair from a bad die job. I love the smell. I found it very clean. The only reason I gave this item a 4 is simple because I don't like the packaging very much. The top is difficult to open and the shape of the spout makes it difficult to pour not your hand without making a mess. As for the product itself, love it!! Great on curly, frizzy, dry hair. Nice scent too! Nice rich lather but I hate the smell of it. At last I have found a good quality shampoo which makes my hair and scalp feel normal again. My hair looks healthy and smooth and not damp. It works well , comparable to some salon shampoo. Only thing I don't like is the smell. Very old fashion..smells like a grandma. Great natural products keep selling the products and I will be buying more. Love all of the Jason products. This shampoo is great, my hair is never dry and frizzy. Leaves my hair looking and feeling great. This light shampoo cleans well. I've got the whole family using it. I particularly like that is has no parabens. I will never use another shampoo/conditioner again! I've been using this brand and haven't cut my hair in over 6 months! My hair feels healthy and clean and the subtle scent is just right. Of all the frizz-taming claims out there, this one does it the best - with regular use. And I love the ingredients list! We love this shampoo. It leaves the hair clean, soft, and not weighed down. Great natural product, felt good on scalp, conditioner to follow. I'm no happy with this product mostly because it was advertised as its original product( which I thought I was buying) It would normally be okay BUT they changed the ingredients, ingredients that are used in engine degressors SODIUM LAURYL SULFATES! The whole reason I bought this product is to be free of those types of ingredients.... So a big BOOOOOOOO to Jasons this time around looks like I will be reading the ingredient lists a little closer even to the products I thought I could trust! If I wanted to torture myself with an itchy, oily scalp then this is the shampoo. Otherwise, get something else.